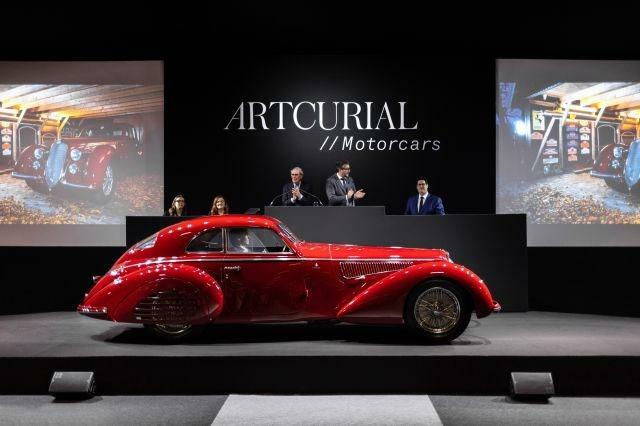 The Rétromobile 2019 by Artcurial Motorcars auction totaled just over €42 million over three days. From Friday, February 8 to Sunday, February 10, 2019, three sales -- cars, motorcycles, F1 drivers' helmets and race suits -- were held as part of the Rétromobile vintage and classic car show in Paris. Auction house Artcurial announced a total of €42,304,574 for these sales, up 31% on the 2018 edition and setting 10 new records. The sale saw three models fetch over €1 million and 43 fetch over €100,000. The star of the sale was a 1939 Alfa Romeo 8C 2900 B Touring Berlinetta, which sold for no less than €16,745,600, becoming the third most expensive pre-war car ever to sell at auction. It was bought by an American private collector. An extremely rare Serenissima Spyder fetched €4.2 million, setting a new world record for this model. A magnificent 2009 Mercedes-Benz SLR Stirling Moss Edition sold for just over €2.6 million, again setting a new record for the model. After Friday's car sale, Saturday saw Artcurial auction an exceptional collection of 90 MV Agusta motorcycles, considered one of the world's finest private collections of classic motorcycles. Finally, on Sunday, an ensemble of Formula 1 drivers' helmets and race suits went under the hammer.